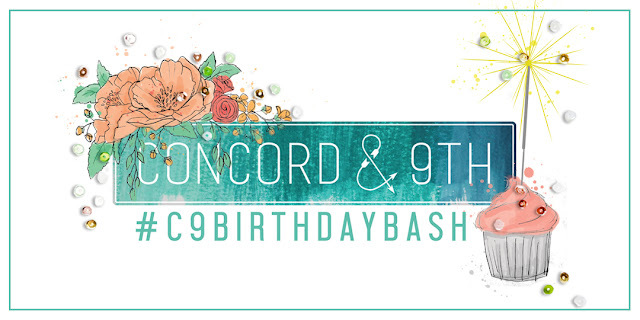 Concord&9th Birthday Bash Blog Hop! Hello everyone! Today I'm going to show you a card I've made for Concord&9th birthday. It is a relatively young company that is gaining popularity quickly because they make really beautiful, clear and elegant designs that I absolutely adore. I like all of them without an exception and I am happy to be invited to feature them and to try their goodies. I am definitely going to get more of theirs! =) Happy birthday guys, wish you all the best! Более того, ребята решили побаловать и вас, друзья, подарив нам шанс разыграть среди вас сертификат на $20 в их фирменном магазине. Для того, чтобы поучаствовать в розыгрыше вам необходимо подписаться на мой аккаунт в Instagram @thingiewingie и/или блог (стать постоянным читателем), а затем оставить комментарий под этим постом и/или в инсте. Каждому комментирующему я присвою номер (по порядку), а затем мистер рэндом разыграет победителя. Если вы оставите комментарий здесь И в инсте, то увеличите свои шансы на выигрыш! =) Комментарии принимаются до 28 августа, до 23:00 МСК, а победителя я озвучу через неделю после подведения итогов. Moreover, Concord&9th are so generous and have issued a $20 gift card for you, readers! =) To have a chance of winning it you need to follow me here and/or Instagram @thingiewingie and then leave a comment under this post or in Instagram post. If you leave a comment here and in Instagram you will double you chances! Each comment will be given a number (in order of appearance) and then Mr. Random will select the winner. I'll collect comments on the 28th of August at 23:00 Moscow time and will post the name of the winner a week later. A gorgeous and elegant the Simply. I of am new to the blog and I of your am a loving your beautiful clean and simple designs. Thanks for sharing and I of am now! Just a follower. I am a new follower here and I found your blog through the Birthday Bash hop with Concord & 9th! I am excited to see your beautiful card and I have that set of dies! Elegant look on your lovely card! Super stunning card! Love it! WOW!!! This is simply gorgeous! Gorgeous CAS! I adore this technique of using dies for dry embossing...your card is so elegant. Simply gorgeous. Sweet card!!! Love the mix of embossing and die cuts!! 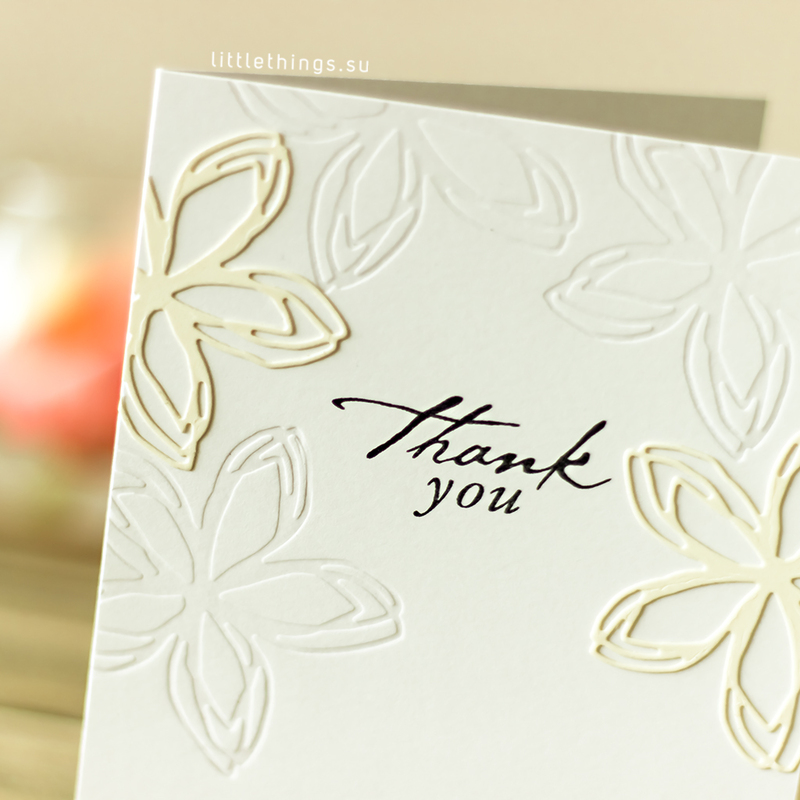 gorgeous card... love how you used the flower die to emboss the cardstock!! So pretty and simple. 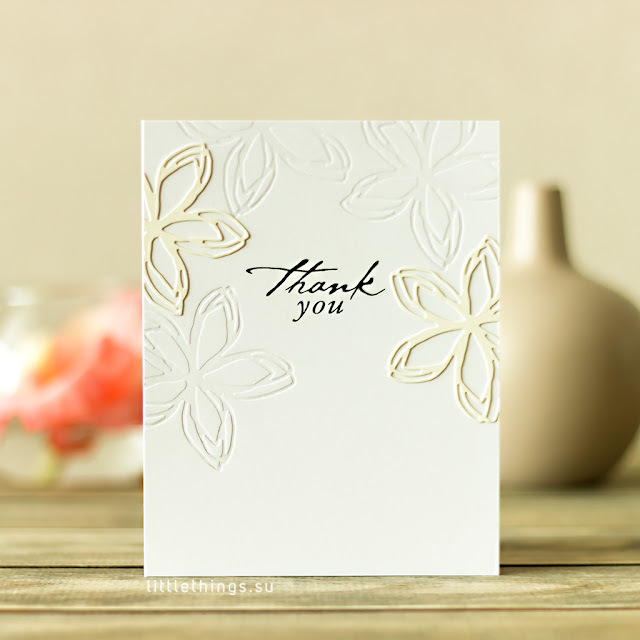 Love the look of the repeated flowers through embossing and stamping. Thank you for the card inspiration and to Concord and 9th for the giveaway! So elegant and very pretty!! Beautiful card. Love the way you embossed and die cut the flowers. So very elegant! thanks for sharing. I adore all the clean space and your use of the ivory color ... so elegant! That darling butterfly doesn't live here in my craft room YET! Love how simple but elegant your card is. Beautiful, elegant card! It is fabulous how you debossed the flower image for more interest! I'm following you on instagram because I love their flowing format! A simple but elegant card. Thank you for sharing your ideas and being a part of the birthday blog hop. A beautiful and elegant card! Such a beautiful and contemporary card. Very creative! Love the beauty and elegant simplicity of your card ! Thanks for sharing ! So pretty! I love the letterpress look - so awesome!! I really like how you've kept the color scheme so minimal! Such an elegant and pretty card. Love the look thanks for sharing. Such a beautiful card! I love the simplistic elegance of it! Just Stunning! Beautiful in it's simplicity and elegance. WOW, love your card. Great way to do something different! Love your card. The die is one of my favorites. This is such a beautiful, clean design...such an elegant look! These look so fabulously elegant debossed like that! I follow you both here and on IG. Love the simplicity and elegance of this card. This is a beautifully simple card! Really lovely. Gorgeous card, love the tone on tone! Love the different ways you created dimension. So pretty. Love the two types of embossing. HI, it is nice to meet you. What a wonderful idea to use that die as a embossing folder. It is so beautiful!!! Thank you for joining the blog hop and sharing your gift!! wow so classic and elegant! Katherine, your card is amazingly beautiful. Well done! Such a beautiful and simple card! I love it! Love this simple elegant card! You card is so beautiful. I love your creativity in using the die to emboss your paper. The simple color choice creates such an elegant card. Happy Birthday Concord & 9th! These dies are wonderful for the technique you used. The tone on tone is really elegant. Открытка просто совершенно!! Она такая идеальная, что даже не верится! Gorgeous, simple and very elegant! Timeless and stunning!! I am following you on IG as meemawof3 and via google here on the blog! TFS! Absolutely gorgeous! Thanks for the inspiration! This is such a clever design. Beautiful! wow--amazing ideas--love the embossing and the die-cutting. You get an innie AND an outie, lol. This card is simply gorgeous! Beautiful card... so lovely and elegant. TFS!! Gorgeous card! Love how you used the die in two ways on your card. This is beautiful! I love the Thank You font. Very elegant!! Thanks for sharing!! Wonderful clean and elegant design. Wow this is so elegant. Love your sweet and simple card! Absolutely gorgeous!!! Love how you impressed the butterflies and only popped a few up. So elegant!! I love the monochromatic look of your card. Fantastic idea to deboss the flower die! Love it! Such an elegant card - love the embossing of your die! I love how simple and elegant your card is! Love the white on white and the great layering technique. Stunning card. Less is definitely more in this case! This is so elegant, Katherine! I love how you've embossed with the die and added a die cut too! All that white and cream are so classy! Your card is so beautiful and elegant! Such a simple yet elegant card. There's just something about an ivory on ivory card that makes it stunning! Simple but stunning card! I love the texture provided by the popping up and the indentation of the flowers! Thanks for sharing. Your card is a Class Act! I really love how you used the die to dry emboss, as well as include die cuts of the flowers. Beautiful! Wow! Amazingly elegant card. I am so glad I found your blog through the Concord and 9th blog hop! Love the texture you created with the die! That is so beautiful right down to the simple font on the message. I'm going to look for the die and the sentiment. I love your card. So subtle and elegant, white on white, a touch of gold, lovely! WOW WOW WOW, this is jaw-dropping beauty! Oh this is so elegant - love the cream and gold combination! You've put this die onto my wishlist! Beautiful card! Thank you for sharing with us. Your card is beautiful in its simplicity!